Copyright: © 2017 Silverio A, et al. This is an open access article distributed under the Creative Commons Attribution License, which permits unrestricted use, distribution, and reproduction in any medium, provided the original work is properly cited. Identifying concussion and initiating removal from play is challenging for even the most diligent youth sports organizations. Empowering parents to implement removal from play protocols and sideline testing may be the most practical plan at community levels to protect young athletes. We developed paradigms for community-based youth sports teams that incorporated both standard concussion protocols and research investigations. The research studies were designed to determine how sideline tests of vision, cognition and balance augment the capacity for parents and other responsible adults to identify youth athletes with concussion in ice hockey, football, lacrosse and cheerleading. Research-based sideline tests were performed at pre-season baseline sessions and during the season at the time of injury or as soon as symptoms were recognized by trained volunteer parent team testers. The combination of standard concussion protocols and research studies were performed for 510 athletes, aged 5-17 years, over 2.5 years through 5 athletic seasons. To implement the protocols and studies, approximately 80 student volunteers and parents were educated and trained on early concussion recognition and on baseline and sideline test administration. Over 80% of parent-identified head injuries were physician-confirmed concussions. Of the sideline tests performed, over two-thirds were administered within 24 hours of injury; the rest were performed within an average of 2.6 days post-injury since some athletes had delayed development of symptoms. Removal from play guidelines and standard concussion evaluation protocols were maintained in the context of the sideline testing research investigations. Based on this observational study, parents of youth athletes can be successfully empowered to perform rapid sideline tests in the context of existing concussion protocols. Implementation of objective testing may improve concussion identification and shift the culture of advocacy and responsibility towards parent groups to promote safety of young athletes. Ongoing investigations will further examine the impact of these programs on concussion management in youth sports. ACR: Advanced Concussion Recognition; CDC: Centers for Disease Control; IRB: Internal Review Board; NYS: New York State; NYU: New York University; SAC: Standardized Assessment of Concussion; SCAT3: Sports Concussion Assessment Tool-3rd Edition; TBI: Traumatic Brain Injury. Concussion is a mild form of traumatic brain injury (TBI), and is a major health concern in youth athletes. In the United States, there are an estimated 1.1 to 1.9 million sports- and recreation-related concussions among children ≤ 18 years old . Children and adolescents appear more vulnerable to concussion than older athletes [2,3], and even mild injuries can affect the thinking, learning, behavior, and emotions of a child’s developing brain [4,5]. Athletes who return to play before they have fully recovered are believed to be more susceptible to a subsequent concussion, prolonged recovery and potentially catastrophic consequences [6,7]. It is essential that concussions are recognized and diagnosed in a timely manner to ensure that youth athletes are treated appropriately and allowed to fully recover. The prevalence of undiagnosed concussion remains an important problem in youth sports [1,8], in part because of reluctance or inability of young athletes to report symptoms [9-11]. Many elementary and high schools do not have the financial resources to have athletic trainers on the sidelines . While coaches have increasingly received better education for determining whether youth athletes require further concussion evaluation , young athletes continue to play with symptoms, often without the awareness of coaches . This may be due in part to a sports culture  that can conflate injuries with weakness, and the fact that coaches have many responsibilities during and after games. One missing and vital piece of youth concussion assessment protocols may be the parents. Parents can help recognize a concussion during play and are also well-positioned to notice symptoms after play (behavioral or emotional changes) that are not noted by the coach. However, many parents of youth athletes may not yet fully understand the significance of concussion [16-19]. A few youth sports programs have begun to examine the ability of parents to administer simple sideline tests; these tests have proven to be accurate in predicting concussion, and at minimum start conversations regarding injury [20-22]. This suggests that if parents are adequately informed on concussion protocols, they can be effectively empowered to assist with recognizing the signs and symptoms and to ensure that injured athletes are removed from play. The basis for creating the Advanced Concussion Recognition Initiative was to incorporate roles for parents in the context of both standard concussion protocols and investigative sideline testing. This represents a new strategy to share responsibility for reducing undiagnosed concussions and promoting youth safety in sports. The purpose of this “methods paper” is to describe in detail the protocols and procedures that youth teams and investigators used to empower parents for both concussion recognition and evaluation of sideline testing. 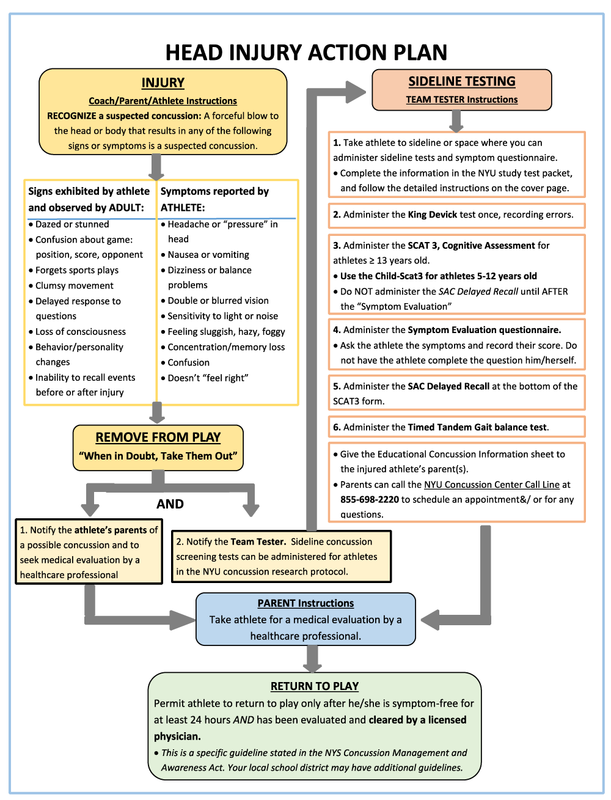 The specific aims of the Advanced Concussion Recognition (ACR) Initiative for the community youth sports groups were to (i) raise concussion awareness through education, (ii) develop a Head Injury Action Plan (Figure 1) applicable to all sports that prompts removal from play and incorporates the research sideline tests, (iii) train team parent volunteers on concussion recognition, administration of concussion screening tests and concussion first aid and (iv) provide baseline concussion screening for youth athletes. Concussion education, training and research studies of sideline baseline and post-injury testing were conducted during five athletic seasons from September 2013 through March 2016 for four community youth sports organizations and one public school district. For the research studies, written informed consent and age-appropriate child assent were obtained for each youth sports participant. Informed consent and assent was a process administered by NYU investigators on-site for the youth leagues. All study protocols were approved by the NYU School of Medicine Institutional Review Board (IRB); participating youth sports organizations were required to submit a letter of participation from the organization’s president or superintendent to the same IRB. Figure 1: Head Injury Action Plan. The ACR Initiative was designed and conducted to be integrated into the “real-world” environment of youth sports organizations, which necessarily incorporate parents, coaches and student volunteers. Research-based baseline and sideline tests included rapid number naming (King-Devick test), the Symptom Evaluation from the Sport Concussion Assessment Tool, 3rd Edition (SCAT3, for athletes 13 years and older) or Child-SCAT3 (for children 5-12 years old) and the timed tandem gait test. These testing components were selected based on research to date and anticipated ease of administration by lay people. All tests were repeated as soon as possible on the sidelines by trained parent testers in the event of a suspected concussion. The youth sports organizations included three suburban programs in ice hockey, lacrosse and football, one urban organization comprised of football and cheerleading, and a suburban public school district that included varsity and junior varsity teams in ice hockey, boys’ and girls’ lacrosse, and football. Major eligibility criteria included healthy youth and high school athletes aged 5-17 years who were registered athletes of the individual sports organization. A grass roots recruitment strategy was employed in which participating athletes were recruited via email through the organizations’ subscriber list, word-of mouth, on-site at various youth sports venues, as well as through various concussion educational presentations by NYU School of Medicine faculty and professional staff. For example, one particular presentation involved a movie screening at a local theater followed by a question and answer session involving concussion experts and members of the community. Each youth sports organization identified a Concussion Coordinator to take the lead in executing the standard concussion protocols for the organization and coordinating with the NYU investigators and volunteer medical advisor supporting the community groups. The Concussion Coordinator then conducted preseason outreach via email to parents and coaches with information regarding the study protocol, as well as the dates, times and locations of the informed consent/ assent process and research-related pre-season administration of sideline testing. An online appointment sign-up for testing was created using a free web app during the third season to improve flow through the testing stations for participants in the research studies. The Concussion Coordinator was responsible for recruiting parent volunteers to serve as each team’s screening tester (aka the “Team Tester”). This individual received standardized training pre-season, assisted with the pre-season baseline testing sessions, administered the tests on the sideline and recorded the data in the event of an injury. To avoid conflicting interests and to allow coaches to continue managing the bench during a game or practice, coaches were not permitted to be Team Testers. All Team Testers were parents of participating athletes, and were present at most games or practices. The Concussion Coordinator was also responsible for communicating with the coaches the standard concussion management protocol (implemented independently from the sideline testing performed for research purposes) and the importance of conducting sideline screening as soon as possible after injury. For the pre-season baseline sessions for research-related testing, additional “person-power” was needed to test multiple teams in an efficient manner. Upper class high school students interested in obtaining community service hours were recruited, with one student trained by NYU investigators as the Student Coordinator. This student leader organized, enlisted and subsequently trained the high school student volunteers over a 2-year period to administer pre-season baseline tests. The Student Coordinator also worked with each organization’s Concussion Coordinator to provide the necessary number of student volunteers at each of the pre-season baseline testing sessions. NYU investigators were onsite at every pre-season session to ensure that only athletes who had provided informed assent and parent/ guardian consent were included in the research-related sideline testing protocols, and that testing was performed according to specifications. Finally, the Head Injury Action Plan was developed to incorporate the NYU study protocols investigating rapid sideline tests into each organization’s existing standard concussion management guidelines as stated in the New York State (NYS) Concussion Management and Awareness Act . The NYS Department of Health’s Concussion Fact Sheet for Coaches and Sports Officials  was used as the standard guideline for parents and coaches and other responsible adults for concussion recognition and removal from play among all youth organizations. Concussion education as provided to parents and coaches included the basics of concussion, recognizing the signs and symptoms, and management (including removal from play). The potential utility of sideline screening assessments under research investigation, and instruction on administration, were also included. The Team Tester training sessions consisted of a didactic presentation followed by a small group hands-on workshop. Given that some parents could not make these sessions due to work and family conflicts, a “train-the-trainer” methodology was utilized, with the additional training provided by individuals who had previously completed training with NYU investigators including the community medical advisor, the youth organization’s Concussion Coordinator or another experienced parent Team Tester. 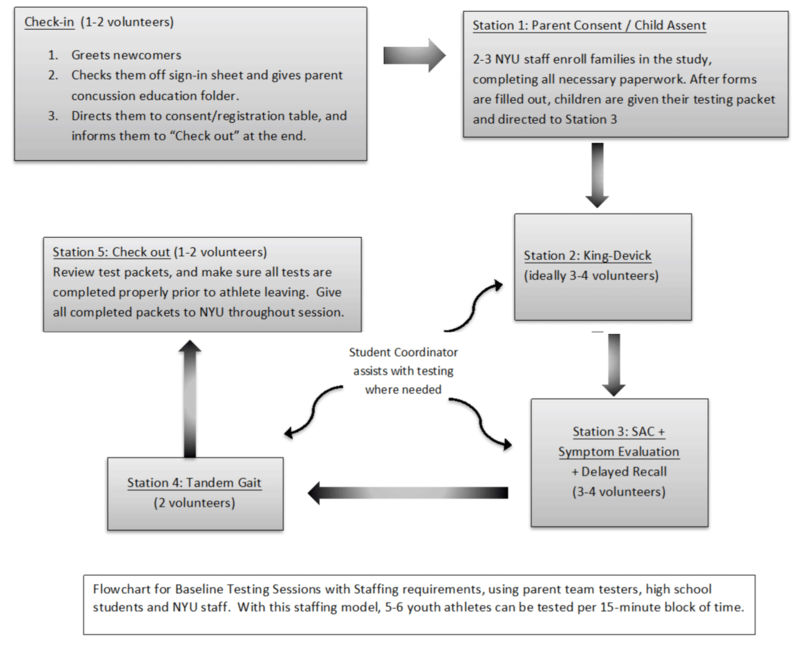 Figure 2: Flowchart of process for team baseline research sideline testing sessions. Station 1-Registration and Consent/Assent: Parents of the youth athletes were required to attend the baseline testing session to sign informed consents; youth athletes signed assent forms as part of the consent/ assent process with NYU investigators. Parents/ guardians were then able to accompany their children through the stations and observe the testing. The voluntary nature of the research-based activities for the team concussion management protocols was emphasized as part of the consent/ assent process. Station 2-King-Devick (K-D) Test of Rapid Number Naming: The K-D test is a vision-based rapid number naming assessment that takes less than 2 minutes to administer. Physical (spiral-bound notebook) versions of the test were provided by the manufacturers. Station 3-SAC (Standard Assessment of Concussion) and Symptom Evaluation of the SCAT3 or Child-SCAT3: The SAC is a brief cognitive battery that captures the domains of orientation, immediate memory, concentration and delayed recall. A maximum total score of 30 is generated by adding the 4 sub scores: Orientation (maximum score=5), Immediate Memory (maximum score=15), Concentration (maximum score=5), and Delayed Recall (maximum=5). The SCAT3 Symptom Evaluation is a questionnaire that captures presence and severity of 22 symptoms associated with concussion. Station 4-Timed Tandem Gait Test: The timed tandem gait test is a measure of balance and coordination in which athletes are timed in seconds on how quickly they can walk heel to toe along a 3-meter line back and forth. It is an integral part of the Child-SCAT3 for testing balance, and is feasibly administered particularly in the youth athlete population. Station 5-Check Out: Concussion education handouts were distributed to participating athletes and their parents at the check-out station, and baseline testing and consent/ assent packets were reviewed for completeness of data. During the athletic season, the teams were instructed to follow the Head Injury Action Plan in the event of a suspected concussion at a game or practice. A suspected concussion was defined as any forceful blow to the head or body that resulted in any of the signs or symptoms of concussion and were otherwise unexplained. Signs included any new neurological sign or symptom, such as but not limited to headache or pressure in the head, nausea, vomiting, dizziness, visual problems, sensitivity to light or noise, feeling foggy or hazy, difficulty with concentration or memory, confusion or not feeling right. In the case of a medical emergency, sideline testing was not performed and a 911 call was warranted with immediate transfer to the hospital. If the athlete associated with the research study did not require immediate transfer to a hospital and was physically able to perform the tests, the athlete was removed from play by a responsible adult, such as a coach, team manager, or parent and the Team Tester was notified to administer the sideline concussion tests. Team Testers followed the detailed instructions provided in their testing packet for completing the data forms. They also provided the injured athlete’s parents with the CDC Concussion Fact Sheet for Parents  as well as following basic concussion first aid of rest with limited physical and cognitive exertion until evaluated by a health care provider. All injured athletes, regardless of enrollment status in the research studies, were evaluated as per the standard concussion management protocols, removed from play and referred to a healthcare professional for formal medical diagnosis and care. In the event a concussion was not recognized at the time of injury and symptoms developed over a few hours or days, Team Testers were instructed to administer the sideline screening tests when feasible, even if days later, and to notify the investigators. The injured athlete’s family was contacted within 24 hours for follow up. At the end of the athletic season, the numbers of injuries were obtained from the Concussion Coordinator for each organization, and the testing packets were collected. There were 510 youth athletes enrolled in the sports of ice hockey, lacrosse, football and cheerleading enrolled as part of the NYU research protocols. Demographics for consented/ assented participants are presented in table 1. In addition, there were 31 high school student volunteers, and approximately 50 parent volunteers trained as Team Testers among all the organizations. The student and parent volunteers performed 758 total pre-season baseline tests over 33 testing sessions throughout 5 athletic seasons; of note, many athletes participated in pre-season research-based sideline testing for more than one athletic season (thus the difference of 510 unique athletes vs. 758 pre-season baseline tests). Table 1: Participants and injury numbers from youth sports organizations. Parents, coaches and athletes were encouraged, as part of the ACR initiative and by the standard concussion protocols, to identify any head injury and to initiate testing even if the injury was minor. As shown in table 1, there were a total of 75 reported head injuries identified by parents, coaches and athletes (including sports- and non-sports-related injuries). Of that number, 83% (n=62) were physician-confirmed concussions. Thus, in some cases where head injuries were identified by parents, coaches and athletes (n=13), medical care was not sought because of early symptom resolution (within 24 hours, n=12) or the physician did not feel that a concussion had occurred (n=1). There were 49 injuries for which sideline tests were administered in participating athletes. Thirty-seven athletes (76%) had sideline tests administered within 24 hours of the injury, and 24% (n=12) were tested more than 24 hours later. This yielded an average injury-to-testing interval of 2.6 days; this finding was attributed to the fact that, for many youth athletes, symptoms developed over time and were sometimes not recognized immediately on the sideline. Of note, the parent Team Testers were not expected to make any determination of whether a concussion occurred; their role was to identify head injuries (in collaboration with the other parents, coaches and the athletes) and to perform the sideline testing for research purposes. The Advanced Concussion Recognition (ACR) Initiative educates parents to recognize the signs and symptoms of concussion, provides guidelines to remove an athlete from play, trains them to perform simple concussion screening tests, and institutes the basic first aid of concussion (i.e. rest) until an athlete can be evaluated by a healthcare provider. Experiences from this collaborative effort, which incorporated participation in sideline testing research with standard concussion protocols, demonstrate that implementing the ACR Initiative may be an effective strategy for improving concussion education, awareness, and management. The number of suspected concussions that were identified by parents and other adults using existing concussion protocols, and the percentage of those suspected concussions that were later confirmed by physician evaluation, indicate that parents are capable of learning and recognizing the signs and symptoms of concussion when provided with effective educational materials and instructions for implementing this knowledge. Furthermore, parents can be feasibly empowered to perform standardized, age-appropriate rapid sideline tests of vision, balance, cognition and symptoms. Pre-season baseline as well as sideline data can be used to emphasize that comparing post-injury test results to pre-season scores is more effective than is the use of age-based norms. While normalized values are obtainable, this Initiative has demonstrated that pre-season baseline testing for sideline assessments can be performed accurately and effectively by students and parent Team Testers. Additionally, such testing is completed without many of the barriers created by requiring physicians or athletic trainers to be present for games or practice. Baseline and post-injury data from the research studies may offer more valuable information in understanding concussion recovery. Furthermore, pre-season baseline scores provide data that can account for the wide variability of individual scores that may be obtained in a youth cohort. The findings of the rapid sideline testing research have been published separately [26,27] and investigations are ongoing with new youth athlete cohorts to refine the numbers and to determine the value of a battery of rapid sideline tests. While many school sports activities are subject to formal state concussion management laws and guidelines, a gap exists with respect to recognizing and managing concussions at the community level. At the same time, this is where the majority of youth sports activities occur. The ACR Initiative has the potential to make significant strides in filling this gap. A key element of the ACR Initiative is to educate parents to recognize concussion symptoms and to encourage the players and their families to seek appropriate medical attention. Leveraging research that shows the efficacy of multi-modal learning [28,29], this initiative as reported for our organizations educated parents through verbal presentations, small group workshops, informational handouts and one-on-one trainings. The simplicity and ease of the test administration was important to examine as well. As such, parents became more comfortable administering the research-based sideline tests through practical experience. The ACR Initiative is also applicable to recognizing possible concussions and encouraging injured youth and their parents to seek appropriate medical attention in the context of all youth sports, across all age groups and in non-sports related situations (such as a bicycle accident or a fall at home or on the playground). Interestingly, while most injuries (80%) occurred in the context of the sport for which an athlete was baseline tested for the research studies, 20% of the injuries occurred outside of the performance of sport, such as while at school. Thus, the universal applicability and sustainability of the ACR Initiative across all sports and recreational activities, as well as over time, was shown to be promising. An important insight of this Initiative is that parents can play critical roles in concussion management that none of the other stakeholders can carry out as effectively. Coaches have multiple responsibilities that may make it difficult for them to recognize the symptoms of concussions and implement concussion protocols . Having medically trained personnel at games or practices is impractical and prohibitively expensive at the youth level in many communities . Given the unique relationships between parents/guardians and athletes, parents and guardians may be the ideal stakeholders to take responsibility for changing youth sports culture in relation to concussions. Parents and guardians are held accountable for their children’s well-being and safety collectively; if they are provided with the appropriate tools and proper training, these adults can be empowered to take on a greater role in concussion recognition, diagnosis, and management in youth sports. Parents/guardians at the game or practice may perform rapid sideline tests much earlier than if the athlete were to wait to be tested until they were able to visit a doctor. Of course, such testing, as performed in the research studies herein, does not substitute for medical evaluation, but can serve to catalyze conversations about concussion and athlete safety at the time of the injury and lessen potential confusion among the responsible adults present. As such, sideline testing provides additional opportunities for Team Testers to reinforce to the parents/guardians of the injured athlete the importance of a physician evaluation. The ACR Initiative can be implemented at very little cost to the youth sports organizations. The Initiative leverages the strong parent volunteer network that already exists in many communities, particularly with respect to youth sports teams. In our experience, parents want to be involved. The costs for testing equipment and licensing can be relatively minor even if borne by the youth sports organization, while the benefits can be enormous. In addition, rapid sideline tests designed to be non-proprietary may offer an alternative and are under investigation in youth, collegiate and professional athlete populations. One of the potential issues with implementing ACR Initiative is that parents may attempt to interpret the results of the testing and make uninformed treatment decisions without consulting a physician. The intention of the ACR Initiative is of course not to replace the diagnosis by a physician, but to assist with recognition of potential concussions and institute removal from play for the safety of the athlete. Existing concussion protocols were followed, and the sideline tests in this case were performed for research purposes only. The Team Testers were only responsible for administering tests and collecting the data, and were instructed to refer all injured athletes to see a doctor for definitive diagnosis. The Team Tester education process should emphasize this point until such time as the sideline tests are considered standard for administration at baseline and at time of injury for aiding in identification of concussed athletes. A key challenge in the evolution of the ACR Initiative was to create an injury action plan that is usable for parents across multiple sports, given the various national governing bodies, such as USA Hockey, US Lacrosse, and USA Football [32-34]. One approach may be to start with requirements mandated by state law and then identify commonalities that can be emphasized. A potential limitation of this study is that injured athletes were not referred to a single healthcare professional, but rather advised to see their personal physician. As such, the concussion diagnosis may differ based on the level of expertise of the evaluating provider. Based on this observational study, there are multiple opportunities for further research with respect to the ACR Initiative. The concussion knowledge base of parents before and after the initiative can be evaluated in order to improve educational materials and ensure appropriate language readability for maximal effectiveness. Also, while the utility of the K-D test to identify concussion has been widely studied [21,22,26,27,35,36], the reliability of the SAC, timed tandem gait, and Symptom Evaluation in youth athletes requires further study. Novel sideline tests for vision, balance and cognition may also emerge. Opportunities for additional research exist with respect to whether the implementation of the ACR Initiative leads to behavioral changes in coaches, athletes and parents in reporting and managing concussion, and in changing the culture for our youngest sports participants. Ongoing investigations will further examine the impact of these programs on concussion management in youth sports. We thank the Concussion Coordinators, executive committee, coaches, team managers, and volunteers of the youth sports organizations and school administrators, staff and students for their contributions and collaboration. We are grateful to the families and children taking part in the research studies. Names of the specific organizations have been withheld to maximize confidentiality of the child participants in the research studies. Centers for Disease Control and Prevention. Report to Congress on Traumatic Brain Injury in the US: Epidemiology and Rehabilitation. Atlanta, GA: National Center for Injury Prevention and Control; Division of Unintentional Injury Prevention, 2015. Tjoumakaris FP, Eck B, Freedman KB, Pepe MD, Austin L, et al. Cost benefit analysis of sports medicine team coverage: is it worth our while? Orthop J Sports Med. 2013; 1. US Lacrosse Concussion Management Plan Guidelines for U-19 Programs. US Lacrosse. 2016. Youth Football Rules Book 2014. USA Football, Inc.